I’ll be the first to admit that when it comes to nonfiction books about the natural world, I prefer photography to artistic renderings. Of course, there are always exceptions. Jim Arnosky’s, Thunderbirds (Sterling, 2011) and Martin Jenkins’, Can We Save the Tiger? (Candlewick, 2011) come to mind. Parrots Over Puerto Rico, however, is an extraordinary exception. Using highly detailed collage art, and employing many textured and brightly colored materials, Susan L. Roth has created a book that accurately portrays the colors of the island and evokes the stunning beauty of the endangered parrots of Puerto Rico. Designed to be read “portrait style,” the collages cover about 2/3 of each double-spread layout. Cindy Trumbore’s narrative appears in a simple black font in the bottom third of the collage against a plain, complementary-colored background. 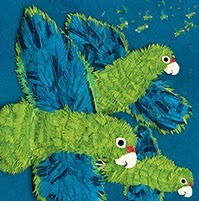 As stunning as it is, the artwork is not the only thing to love about Parrots over Puerto Rico. An astute teacher’s dream, Parrots takes a holistic view of the parrots’ rapid decline and slow slog back to viability in the wild. As the story of the American Bison is forever entwined with the story of American Westward expansion, the Puerto Rican’s parrot story is entwined with that of the Tainos, the Spaniards, and the Americans, as well as that of invasive species, and natural disasters like Hurricane Hugo. Existing for millions of years on the island of Puerto Rico, they once numbered in the hundreds of thousands, and by 1975, had dwindled to only 13. Above the treetops of Puerto Rico flies a flock or parrots as green as their island home. If you look up from the forest, and you are very lucky, you might catch the bright blue flashes of their flight feathers and hear their harsh call. These are Puerto Rican parrots. They lived on this island for millions of years, and then they nearly vanished from the earth forever. This is their story. An Afterword contains photographs and information on the Puerto Rican Parrot Recovery Program. Also included is a timeline of Important Dates in the History of Puerto Rico and Puerto Rican Parrots, and Author’s Sources. You can see a preview of Parrots Over Puerto Rico on Lee & Low’s website, however, it doesn’t do the book justice, as the preview is in landscape mode, while the actual bound book reads lengthwise. Still, it’s worth a gander. A book four years in the making, with the grand aim of squeezing the entire cosmos into 10 pop up pages, The Story of Stars by Neal Layton (@LaytonNeal) doesn’t disappoint: It is exciting, funny and eyepopping. Opening by placing the reader at the heart of the book (“Each night as the sun goes down, the sky grows dark and the stars come out, you might look up at the stars and wonder, ‘What are they? Where are they?’“) Layton uses a historical narrative to explore how our knowledge and understanding of the night sky has developed. As arguably the most important star for human beings, a couple of spreads are then dedicated to the sun (what it is like and what impact it has on us) before moving on to thinking about what else you can see in the night sky and how it is being explored. A very satisfying ending suggests that young readers themselves may be the ones to further add to our knowledge about the universe when they grow up, once again locating the young reader centrally in the story of the stars, making it relevant and exciting to them. Layton has illustrated many non fiction books for children. I think some of what makes them so successful is his unstuffy, slightly scribbly, loose style. Not only do kids find this accessible, his characters and cameos are often funny with their big noses and wonky faces. Hand written annotations on his illustrations look almost like a child could have added them, (subconsciously) bringing the reader yet closer to the subject matter of book. Click here to see some interior spreads from the book. Whilst pop up books are generally not loved by libraries and schools, children simply adore opening flaps, turning wheels, seeing cut-outs leap off the pages, and the paper engineering (by Richard Ferguson) in The Story of Stars is great fun. Surprises for the reader start on the very first page, with the most engaging colophon I’ve ever seen in a book (for once children will naturally find themselves reading the brief description of publication notes) ! Particularly effective is the simple but stunning opening of the skies to show the location, names and stories behind a selection of constellations, thought children will also love the elements which are a little more well hidden; there’s nothing like playing “spot the secret flap”, especially if adult readers haven’t noticed it! A highly engaging and humorous introduction perhaps particularly appropriate for for 4-8 year olds, I can whole heartedly recommend The Story of Stars. It’s STEM Friday! If you’re sharing a review of a STEM book on your blog, please join us by leaving a link in the comments. Copyright ©2014 Zoe Toft. All Rights Reserved. OK, I admit it: I picked this book for its cover. How could I resist the graph paper with bits of erector set and dis-assembled toys scattered across the bottom? 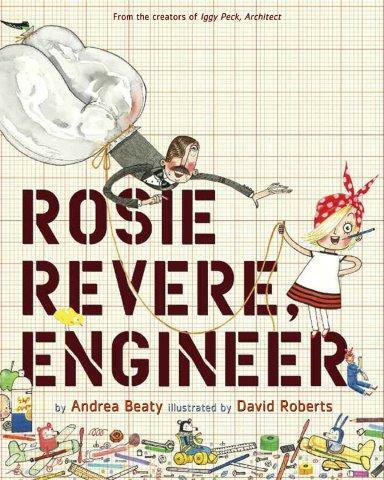 Or the first line: “This is the story of Rosie Revere, who dreamed of becoming a great engineer”? Rosie’s the shy girl at school. But back home, she creates wondrous gizmos from recycled stuff: straws, toilet-paper tubes, springs, doll arms… inventions she shared until her uncle laughed at her attempts. After that, Rosie quit showing anyone the things she creates. … one day great-great-aunt Rose shows up. Aunt Rose, who helped build airplanes a long time ago. Aunt Rose who encourages Rosie to build a flying machine and, when it crashes, laughs till her eyes fill with tears. Rosie is ready to give up. It’s a failure, she thinks. Not so fast, says Aunt Rose; before it crashed, it flew. It’s not a failure, but a Brilliant First Flop. A Brilliant First Flop that was “a raging success”. With that in mind, Rosie discovers (as do all engineers) that you’ve got to work through a lot of flops before you get that final design that works. This book is great on so many levels: it encourages girls to explore engineering; it puts “failure” into the correct context of “just a stage on the road to discovery”; and it reminds us of the “can do” spirit of Rosie the Riveter. Not only that, the graph-lined endpapers provide room for young inventors to doodle their own designs. It’s STEM Friday! If you’re sharing a review of a STEM book on your blog, please join us by leaving a link in the comments. And if you’re looking for some hands-on engineering ideas, head over to Archimedes Notebook. Copyright ©2014 Sue Heavenrich. All Rights Reserved. 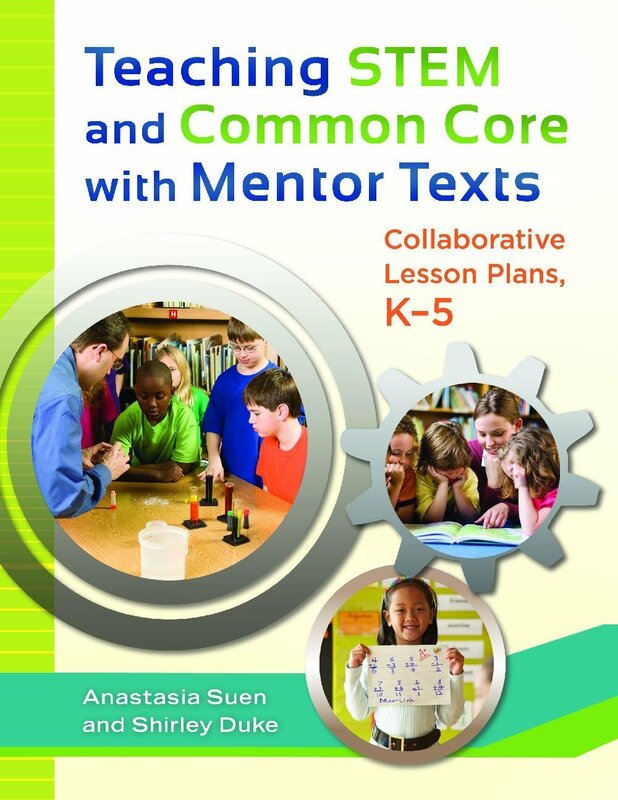 To celebrate their new 2014 book, Teaching STEM and Common Core with Mentor Texts: Collaborative Lesson Plans K-5, Anastasia Suen and Shirley Duke will post lesson plan excerpts on their new Teaching STEM blog every Friday from January 10 to May 30. You can sign up to have these 21 lesson plan excerpts emailed to you. 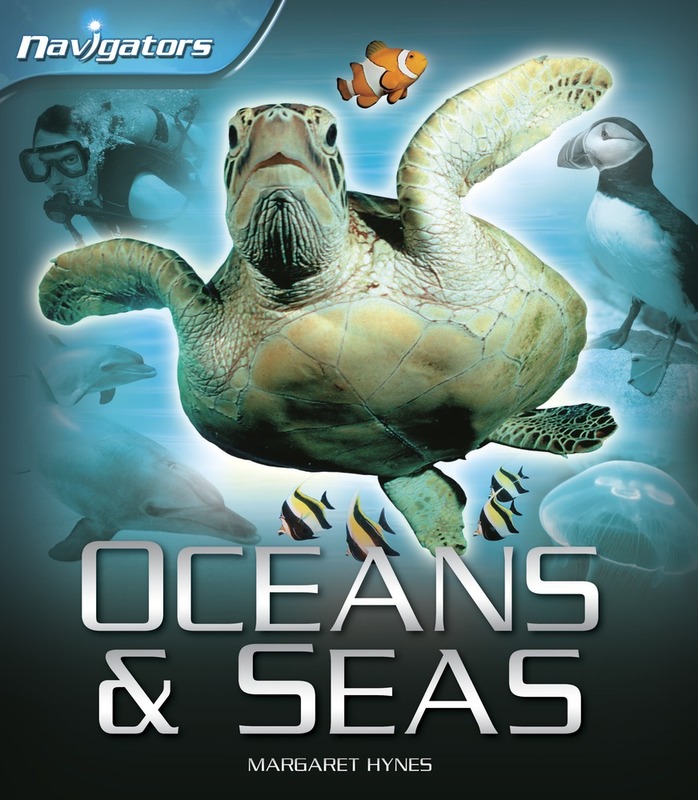 Teaching STEM and Common Core with Mentor Texts explains the basics of STEM (Science, Technology, Engineering, and Mathematics) and shows how librarians can become a key component in STEM education, guiding teachers and sparking interest though the books and technology inherent in their curriculum. The volume offers 21 mentor texts, plus in-depth, collaborative lesson plans linked to the Common Core Standards for K–5 librarians. There are additional lessons for classroom teachers, as well as activities that can easily be done in the library or classroom. Each lesson includes mentor text information, an overview of the lesson, step-by-step lesson plans, assessment options, and extension activities. By implementing these lessons in the library, librarians will be able to cover multiple Common Core State Standards and science standards, and at the same time establish the library as a resource for teaching STEM subjects.